Once again, the beautiful JW Marriott Tucson Starr Pass Resort & Spa played host to Tucson 23, Arizona's premier Mexican food festival, which took place on Saturday, June 17. I was invited to check in on Friday to take advantage of the pre-festival Celebrity Chefs Dinner and to enjoy this amazing property. Mexican-inspired amenities welcomed us to our room. We were then escorted to The Signature Grill for a special chefs' collaboration dinner. Executive chef David Fransua was joined by Michael Byrer, executive chef of downtown's Elvira's Restaurant Tequila Cocina Vino. We settled in on the patio with its gorgeous Sonoran desert views as we sipped on agua frescas and nibbled on Mexican appetizers. With these two talented chefs at the helm, we knew we would be embarking on a memorable culinary journey. Beverage director and acclaimed mixologist Eric Harding of Elvira's also joined as a special guest for signature cocktail pairings. Maize (corn) was the theme of the first course and we were treated to a fabulous duo. Chef Fransua's sophisticated take on street corn showcased butter-braised corn layered with a spicy lime aioli, cotija cheese, cayenne oil, and huitlacoche with a crowning touch of a fried squash blossom and popcorn shoots. Eric served his wonderful Elote de la Calle, a union of Montelobos mezcal, roasted corn syrup, Ancho Reyes chile liqueur, and fresh lime juice. Chicharron was course two, which brought Chef Byrer's mizuna and purslane salad tossed with sweet dried corn, radicchio, and crunchy chiccharones in a tangy vinaigrette made with tamarind, honey, and chile de arbol. This was paired with Eric's Pacifica, a vibrant combination of Rancho Tepua bacanora, beet juice, sage, and lime, topped with a sea salt foam and a sprig of fresh rosemary. The classic Mexican seafood dish agua chile was Chef Fransua's inspiration for course three. Brewmaster Mike Malozzi of Borderlands Brewing Company described his Citrana, a Tucson sour beer, which was paired with a dish of tender braised octopus complemented with a bright lime broth, compressed cucumber, epazote, chive blossoms, and a creamy avocado and jalapeño puree. Both chefs joined forces for the main course, which turned out to be the crowd favorite: A duck duet of cinnamon-roasted breast and chile morita-cured duck confit with a 23-ingredient mole xiqueño, blackberry crema, and pickled mango paired with an Ultima Tormenta which echoed the blackberry component, made with Fortaleza reposado tequila, Grand Marnier, blackberry gastrique, agave nectar, lime and jalapeño. Chef Fransua shared a story of childhood memories as he introduced his capirotada with banana and cinnamon ice cream, golden raisin compote, marzipan, and citrus-agave syrup. The pairing of La Obscuridad (sotol, port, damiana liqueur, and chocolate bitters) was the perfect finale. Bravo to the culinary and beverage talents involved! It was a magical evening to kick off the Tucson 23 weekend. 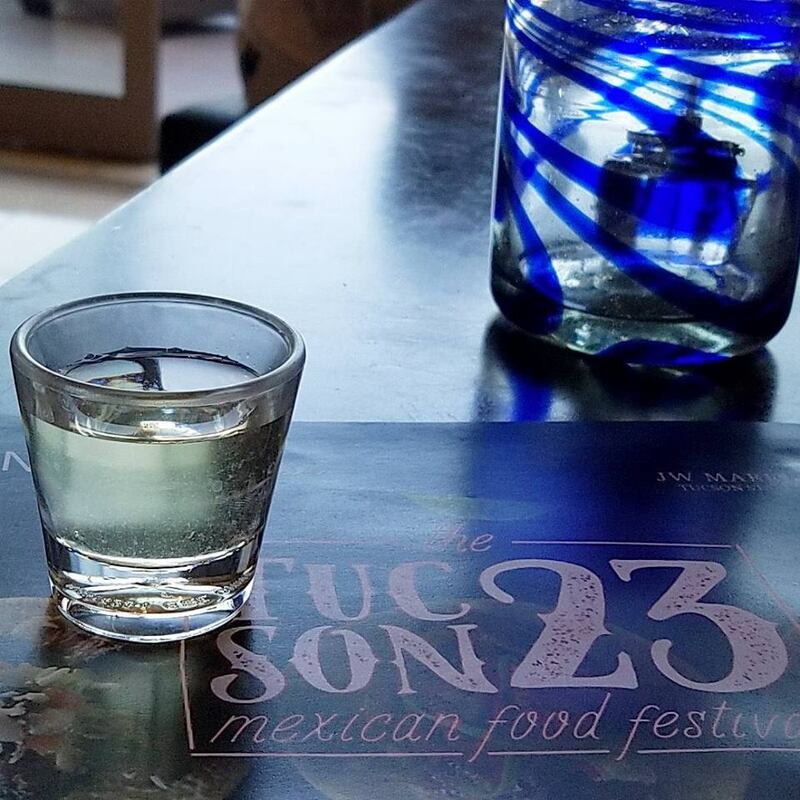 Check back later this week for a photo recap of the Tucson 23 classes and food festival. I was hosted by the JW Marriott Tucson Starr Pass and my weekend was complimentary.